Today I deliberately kept my options open with what to do. Looking at the forecast last night over dinner the Met was talking about heavy showers around mid day. Waitomo to Te Kuiti was only 14km on the trail and it was going to a relatively quick day so I was thinking wake early, check the weather again and if rain is still predcted get out by 6:30am to make it to town before the rain arrives. As it turned out, on waking, the rain had been put back by 6 hours or so and wasnt due now until the early evening. Nothing for it but to go back to sleep and enjoy a lay in for a change, in a bed at that. I was out the door by 8 am just in time for the local cafe to open and grab a coffee. I had meant to resuppy for a day in Waitomo but looking around yesterday, options were limited. The Waitomo General Store is not a general store as you or I typically know one to be. It was basically a bar slash cafe with a book case of odds and ends of overpriced really basic foods like a couple of packets of pasta. Not much in the way of breakfast stuff. Knowing this, I ordered a large pizza for dinner last night and retained a third for breakfast. Pizza and coffee – perfect start to the day. There was no sign of any other TAers about so I hit the road solo around 8:30am. 2 kilometres up the main road and it was into private property and paddocks. Another wet shoe start to the day. This soon entered into a private forested section to climb up a steep hill. For a track on private property I was impressed. The trail had been hand cut from the hill, benched neatly and used swtiched backs instead of going straight up hill like so many tracks do. To top this off there were signs of recent pruning to cut back some gorse and widen some sections of the track. The property owners (I’m assuming) have obvious put in quite a bit of time to create and maintain a sustainable track and must be congratulated as they really have no obligations to the trail at all. So this climbed up quite a steep hill but with the grade and switchbacks made for fast climbing albeit a little sweaty. The sun was out this morning and did make for humid conditions. Down the otherside it was back across more paddocks,a little chewed up by stock and into another forested section following a fenceline to the east. Some of this was a little overgrown with gorse but no dramas really. I then came to a new section of trail opened just this year to divert around a relatively steep descent. Some of this work must literally be days old as the earthy smell from the overturned soil was fresh in the air and the soil friable and bright clayey orange, yet to be affected by rain or compacted by 100 pairs of boots. Rather than following the fence straight down the new trail now meanders on a good grade switch backing it way down slope. It made for easy walking right to near the end. It’s at the bottom of the slope that the new track is yet to fully completed. It’s cleared, open and easy to move on but hasn’t had the final touch up snd benching out just yet. No worries, easier on the knees than straight down. A great little section of track. So then it was back out into paddocks freshly planted with what looked to be turnips and out along a ridgeline high above farmlands beliw with commandibg views right over ti Te Kuiti. It was here I had to have a break. Taking 5 sitting out in the morning sun and soaking in the view was awesome. I need to find more time to do this. Very refreshing. The best was yet to come. From my vantage point it down through more paddocks and onto a farm road for a bit before walking across a swing bridge over the Mangapu River and into the Pehitawa Forest. 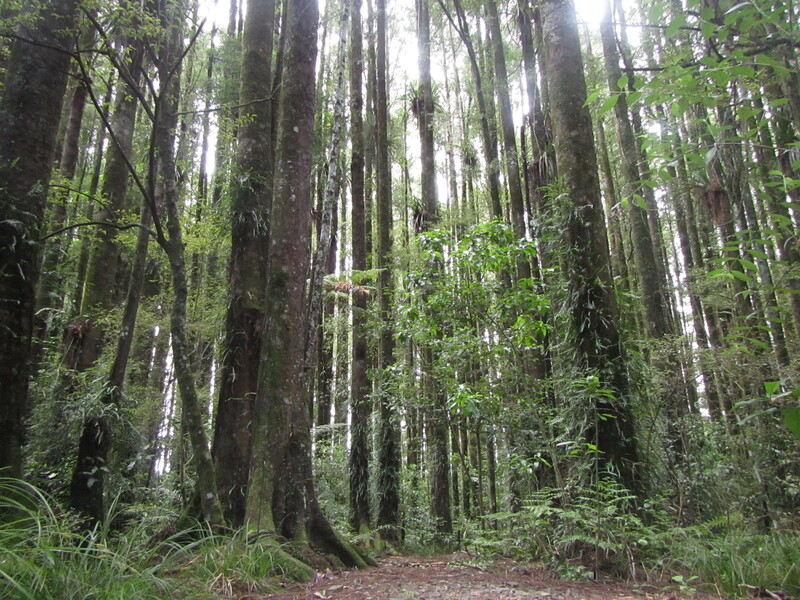 This small forest reserve was the highlight of my day although way too quick. The 10 min stroll through was not enough. The reserve has been set aside to preserve a type of native cyprus that used to be widespread on marshy lands, now very few ate left. The mature trees were huge and it was such a pleasure to walk through their 500 year old grandure. The reserve is so small though, I wanted the walk to continue through more but no, out into the cattle trodden paddocks again. This continued for the next 5km and must have crossed many multiple properties. There would have been more than 15 stiles to cross. On a couple of occasions there was stock in the paddocks and I’m always a little apprehensive at first. I look to see it they are cows and if so thats all good. The steers can get a bit inquisitive and follow you around or move towards you but its the bulls I fear. Walking througone paddock that was thick with cows the next trail marker couldn’t even be seen. And looking across to the next paddocks there was a bull or two. Luckily the next marker pointed away from the bulls and into the young steers. 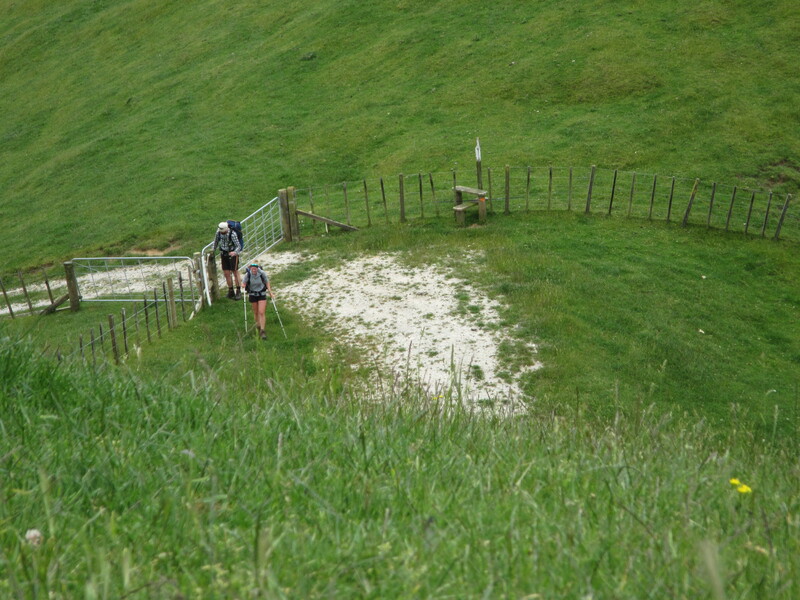 It was then upto a trig point high above and over looking Te Kuiti. 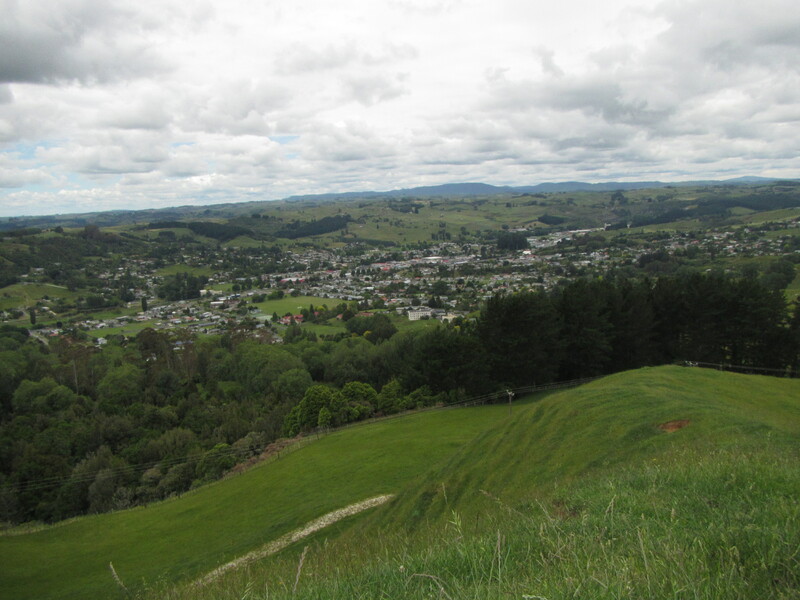 Great views back out across Pirongia Mountain and down towads town. While I enjoyed the view Chris and Cathi joined me for a few minutes to soak it all in. From there a quick 1km into town. An early end to the day and a half day really. The trail pops out at a Cafe and I headed in to grab a coffee. It was here I met another TAer from the United States, ‘The Princess of Darkness’. This was a trail name, a nick-name, which form part of the long distance trail walking culture in the States. Knowing this, I figured the POD had walked one or more trails in the US. Turns out she is an accompished thru hiker having completed the triple crown in the states plus more. She was walking with ‘Disco’ and ‘Skitles’ who wete yet to reach town. I like the trail name concept. Much easier to remember all the walkers that you meet instead of first names but it hasn’t quite caught on for the Te Araroa yet. Perhaps it will evolve here over time or some original TA tradition to rival it. But remember you can’t pick your own name, they are given to you by other walkers, usually for doing something really stupid like all good nick-names.